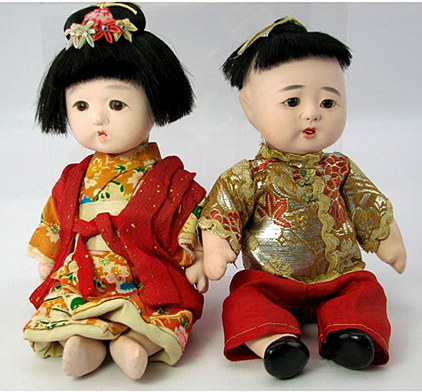 Ichimatsu dolls represent little girls or boys, usually with glass eyes and flesh-colored skin, originally made of gofun, a smooth, porcelain like substance made from ground oyster shell. 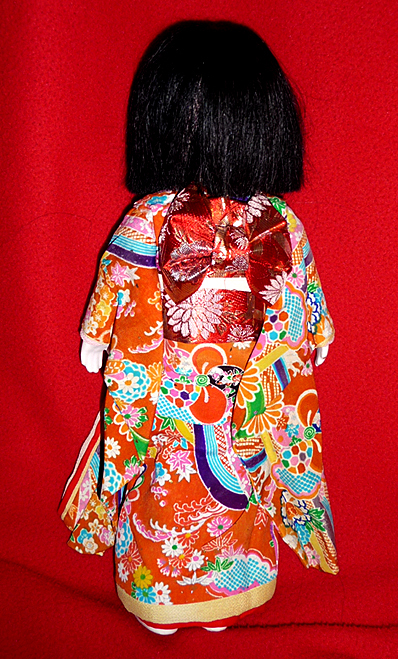 The original Ichimatsu were named after an 18th-century Kabuki actor (who also had a checkerboard pattern named after him, as he wore it a lot), and must have represented an adult man, but since the late 19th century the term has applied to child dolls, usually made to hold in the arms, dress, and pose (usually with elaborately made joints or with floppy cloth upper arms and thighs). 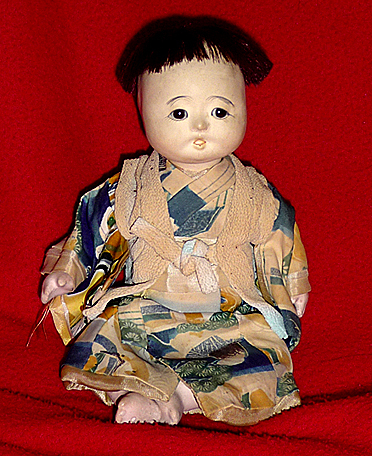 Baby boy dolls with mischievous expressions were most popular in the late 19th and early 20th century, but in 1927 a Friendship Doll exchange involved the creation of fifty eight 32 inch tall dolls, representing little girls, to be sent as a gift from Japan to the United States, and the aesthetic of these fifty eight dolls influenced dollmakers to emulate this type of a solemn, gentle-looking little girl in elaborate kimono, so, since then, many ichimatsu were made to look more like those Friendship Dolls. 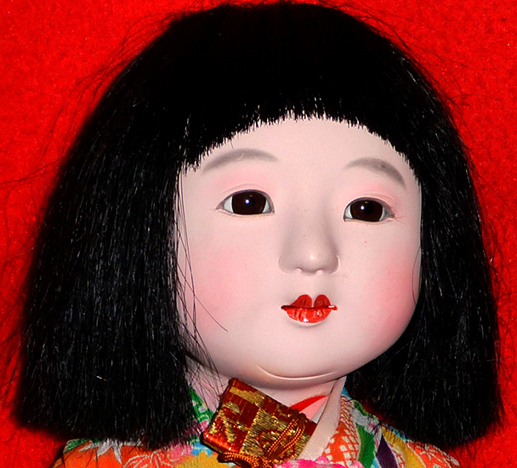 The exchange of dolls began when, few years after the great Kanto earthquake of 1923 in Japan, American children sent 12,000 blue-eyed dolls to Japanese children. 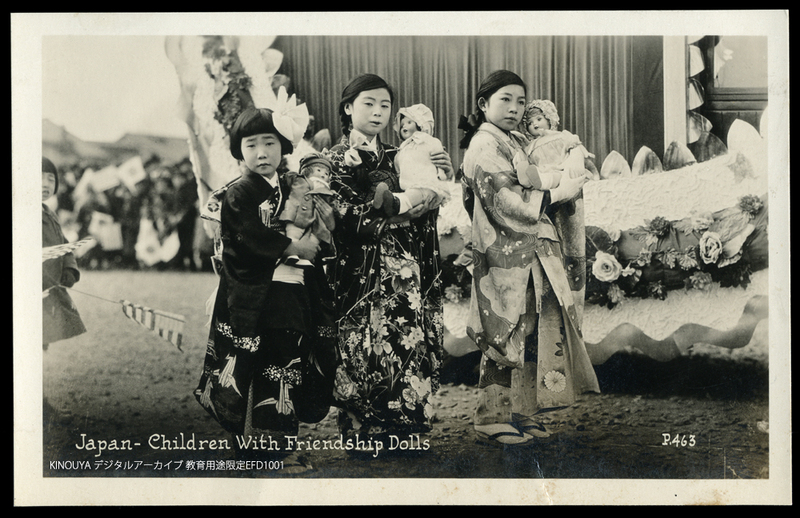 After that, the 58 highly ornate, beautifully crafted Japanese “Friendship Dolls” were sent by Japanese children to America. Many childrens wrote letters to be sent along with the dolls. These dolls toured all over America and were later distributed among museums and libraries all over the country. When noting the difference in the number of dolls, remember that the America is and was much, much larger and richer than Japan. 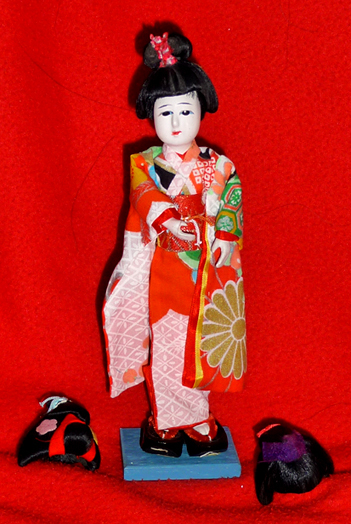 The Japanese dolls were also much more ornate and had more craftsmanship and were sent with large amounts of accessories. There is more about those Friendship Dolls, further down this post, after the photos of my own dolls. 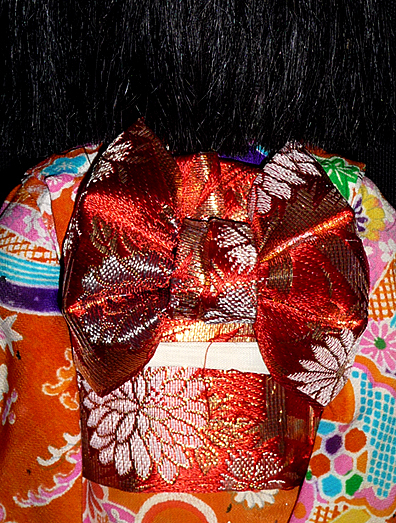 Vintage ichimatsu are popular with collectors, even if their kimonos are rather faded. Some are quite simple, some have very elaborate costumes. My largest and favourite ichimatsu doll. 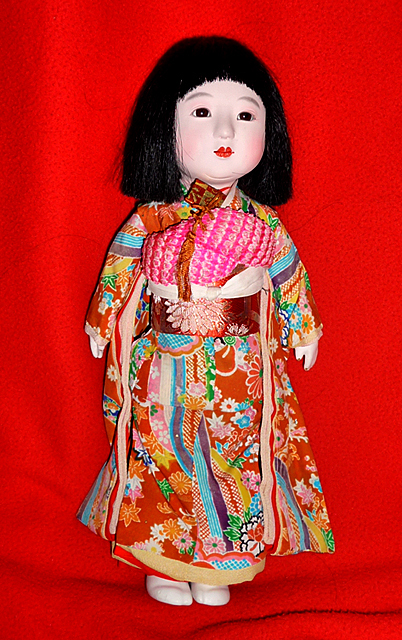 She is in particularly good condition, about 14 inches tall and very much in the style of the 1927 ichimatsu friendship dolls that were gifted to the US. Chubby face and flowers in her hair . Looking a little taken aback. She looks a bit worried. 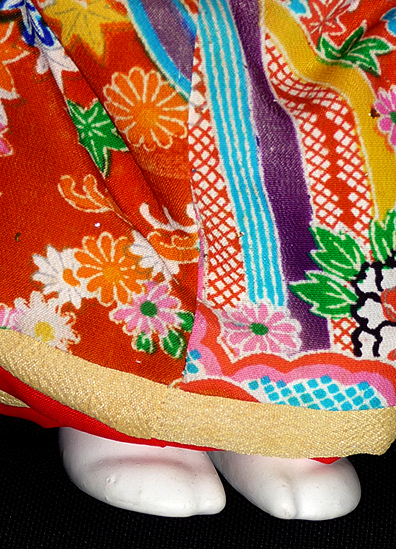 You can see that her clothes are faded when you move her kimono sleeve to reveal some deeper colour. 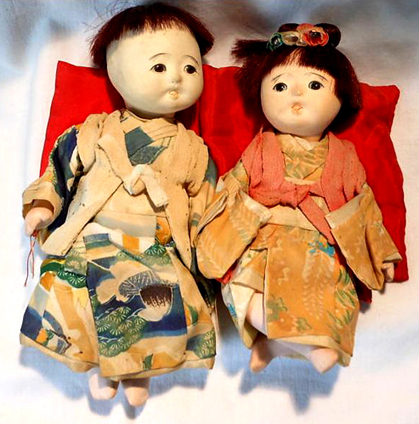 Many vintage icchimatus dolls are faded, as they are old and the fabrics used are prone to fading if displayed in sunlight for long periods. She has a little brother too. 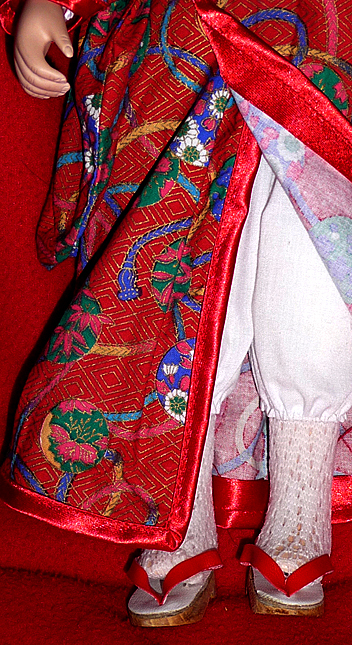 They each have a little, red zabuton; a Japanese pillow that is especially for sitting/kneeling on, on the floor. I need to clean his face, though it is not actually as mucky as it looks in the next photo. This time it is a Japanese girl with her Chinese friend. 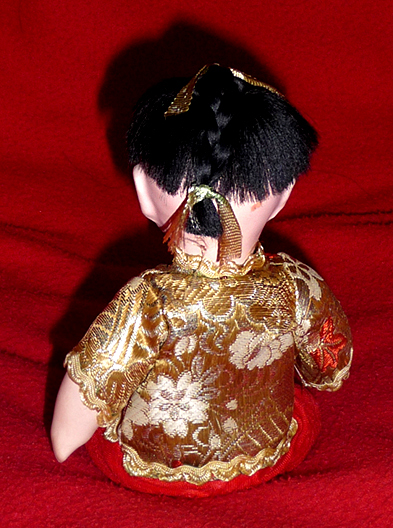 He is chinese, complete with plait in his hair, but is a Japanese doll. The sweet little boy is her Chinese friend. 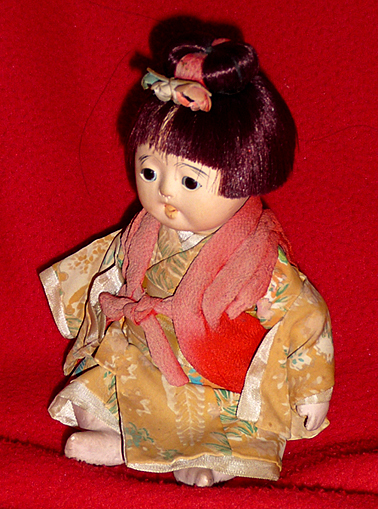 This one is very little, about 5 inches tall, and not really an ichimatsu doll, in that she is more a dress up doll than one children could cuddle. I just came across her when I looked out the other dolls to photograph them. She comes with three wigs to go over her short hair. This last one is rather more modern, around 40 years old. She has glass eyes and her face, hands and feet are porcelain. I will probably keep this one too. At the moment, that is undecided. My daughter has a sweet, little one too. 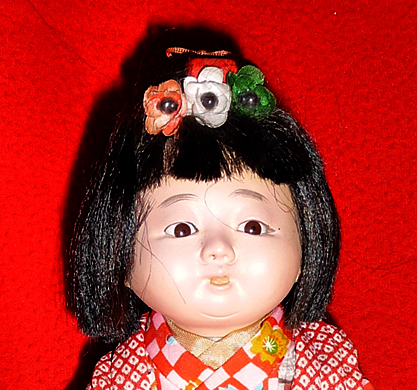 I have a few other Japanese dolls but not all are ichimatsu ones. Here you can see some of the original Friendship Dolls from Japan, there is also a link to sites showing more. The whereabouts of all but one seems to be known, though the people handling their delivery in the US in 1927 seem to have been very inept and they mixed up some of the dolls (each from a different place, with a name reflecting it, so those had the wrong names and places connected to them for a while) and they mixed up many of the accessories that came with them, so lots of the dolls now have a mix of accessories made specifically for them and those made for the other dolls. 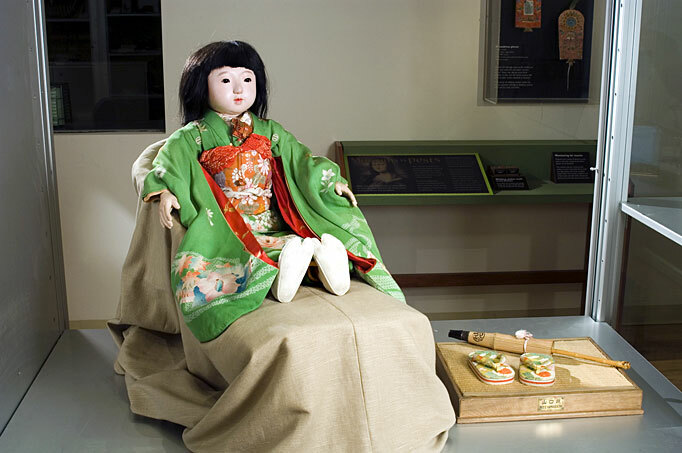 In July 2009, the 83-year-old friendship doll, named Miss Mie (see her below), was escorted to her original home in Mie Prefecture, Japan, by museum collections assistant Susan Curtis to undergo expert conservation, followed by various homecoming celebrations and exhibitions in 10 cities across the region. More than 30,000 people attended the exhibitions before Miss Mie’s return to Nebraska in late May. She will remain a part of the museum’s permanent anthropology collections. 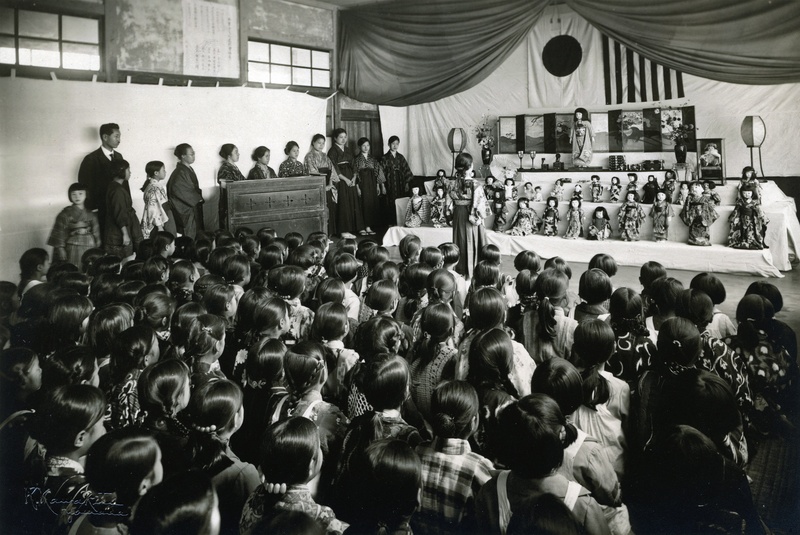 Below, you can see that Japanese school children brought their dolls to bid farewell to Miss Mie before she departed for America in 1927. (University of Nebraska State Museum Archives). Japanese children with the friendship doll exchange dolls received from America. Here are some more of the original friendship dolls. 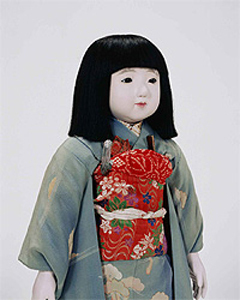 When Miss Yamaguchi arrived in the United States, her first home was Chicago, Illinois, in the Children’s Museum at the Art Institute of Chicago. She has lived at the Museum of International Folk Art since Chicago native, Florence Dibell Bartlett, founded it in 1953. The children of Iwate Prefecture, Japan and the children of Birmingham, Alabama participated in a friendship project. The Committee on World Friendship Among Children sponsored this project. 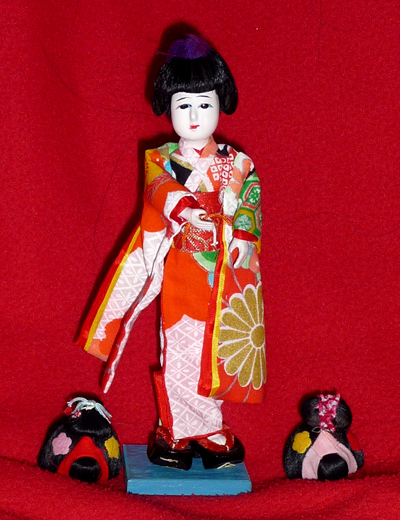 The children of Birmingham sent several dolls to the children in Iwate Prefecture, Japan. 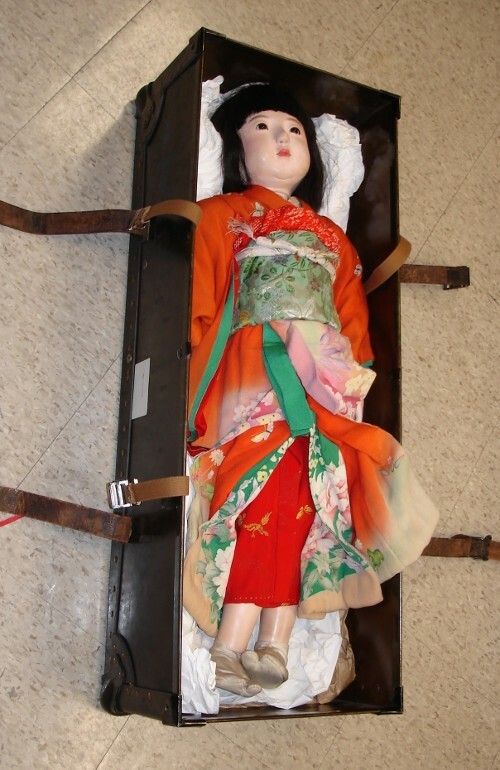 Miss Iwate, who is actually life sized, arrived in a black trunk with an extra trunk for her furniture. She has a chest of drawers, a sewing table, a complete tea service, two lanterns and two small dolls to keep her company. Over the years Miss Iwate has been on display at the Library for various functions. 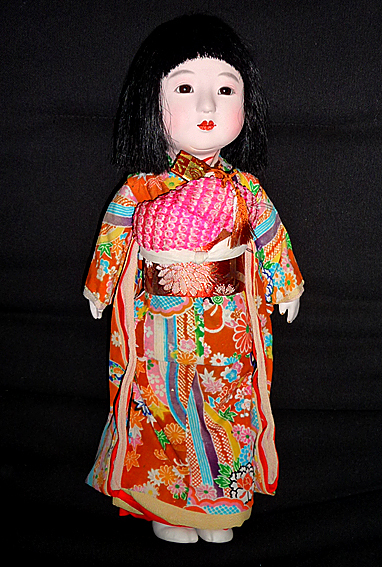 She was on exhibit during the Festival of Arts salute to Japan in 1967. Miss Iwate is available by appointment only. She cannot be held or touched. By the time Miss Kasumi Tsukuba got to Milwaukee in 1928 she was already a well travelled little lady, showing signs of the wear and tear constant parties and travel could have on a small frame. The American handlers confounded matters a little too, often confusing the chests, toys and identity papers of Miss Tsukuba and her sister dolls. 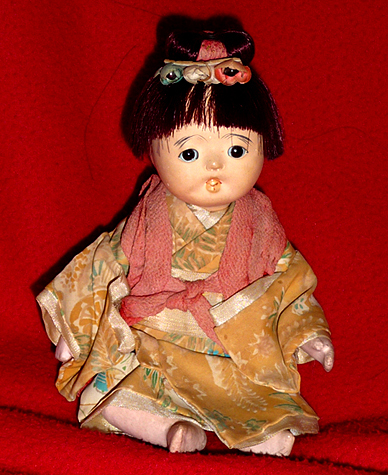 By the time they were distributed to their permanent American homes, some dolls had mix of others’ effects, and in the case Miss Tsukuba, even a new name. Miss Kasumi Tsukuba’s accessories carry two differing symbols, the peony and the mountain cherry blossom. The objects marked with the peony are appropriate to Miss Tsukuba. Her parasol is that of Miss Nagasaki. 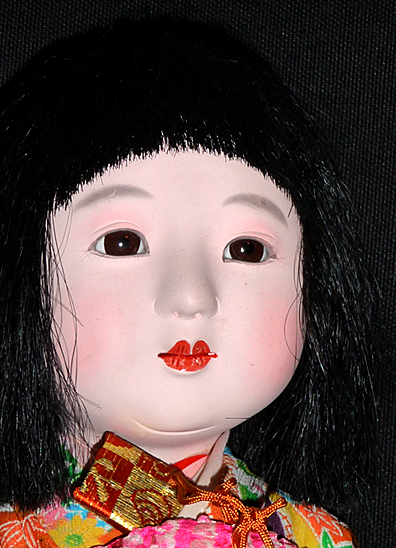 Letters written by Japanese children for Miss Ibaraki and the original doll stand were sent to Nebraska and reside with the doll known as Miss Mie. 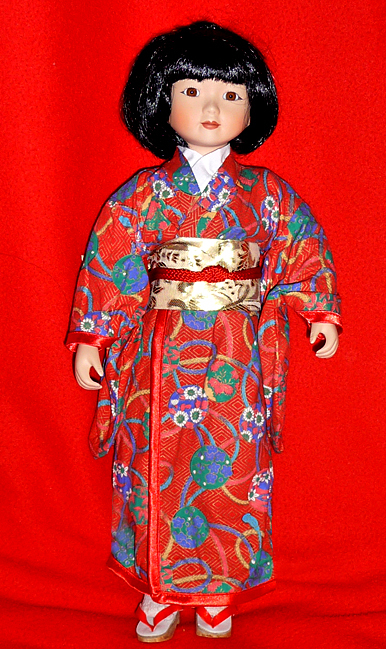 The symbols on the MPM doll’s kimono are representative of Tochigi Prefecture leading doll scholars to believe Miss Tsukuba may really be Miss Tochigi, Sachiko Nikko. For over 80 years, however, she has been known as Miss Kasumi Tsukuba or “Miss Ibaraki”. She’s tall, with mahogany hair, a luminescent complexion and a pedigree that would raise a discreet eyebrow on the most well-bred face. 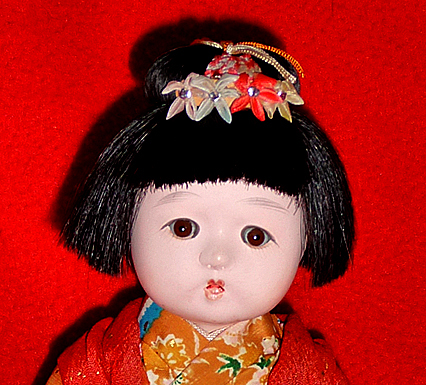 She’s Miss Osaka Prefecture, one of 58 “Doll Ambassadors of Good Will” sent to the United States by the Japanese in 1927. 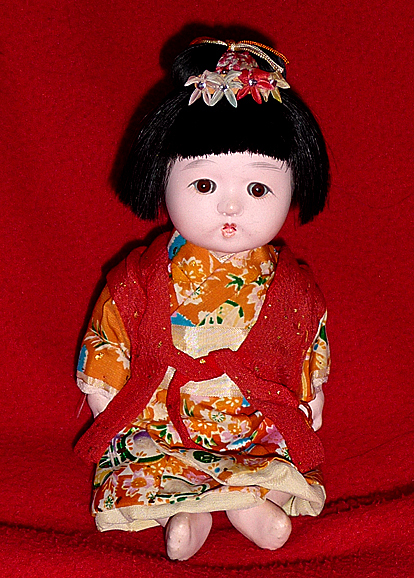 She’s been part of the OHS collections since 1929.
the Society’s understanding of the Miss Osaka Prefecture grew when Keiko Tanaka visited the Ohio Historical Center on behalf of the Clark Center for Japanese Art and Culture in Hanford, Calif. Tanaka exchanged records information with OHS Collections staff and photographed the doll and its accessories. During her visit she shed light on some longstanding questions. 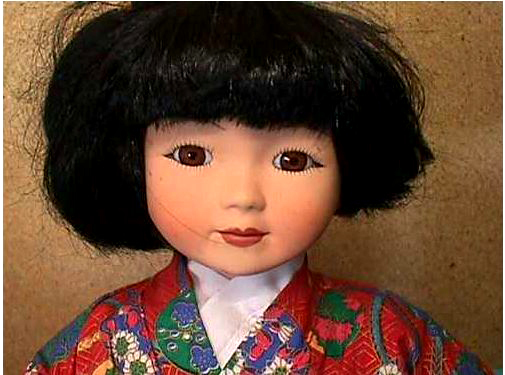 Tanaka revealed that the diminutive stateswoman is distinguished among her peers as one of the early creations of Hirata Goyo, the first Japanese doll maker designated a Living National Treasure by the Japanese government in 1955. His works enthrall many with their outstanding artistry and beauty. 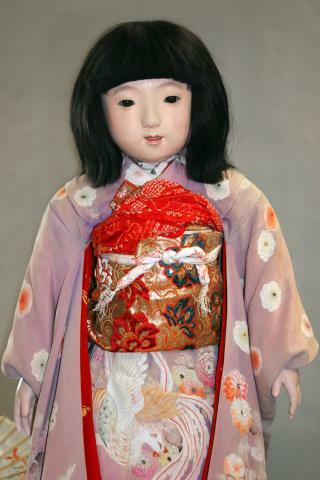 About 33 inches tall, Miss Osaka Prefecture represents a Japanese girl about 7 years of age. She has a thick mane and eyelashes made of human hair and porcelain-like skin made of paulawnia wood powder, wheat gluten and powdered oyster shells. 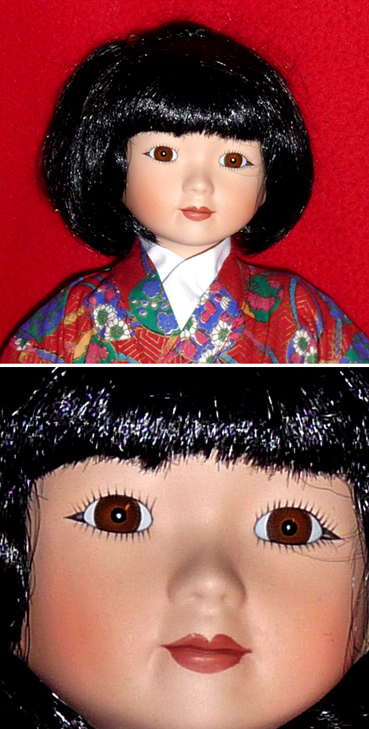 Goyo’s dolls had more life-like features than most of the doll ambassadors. 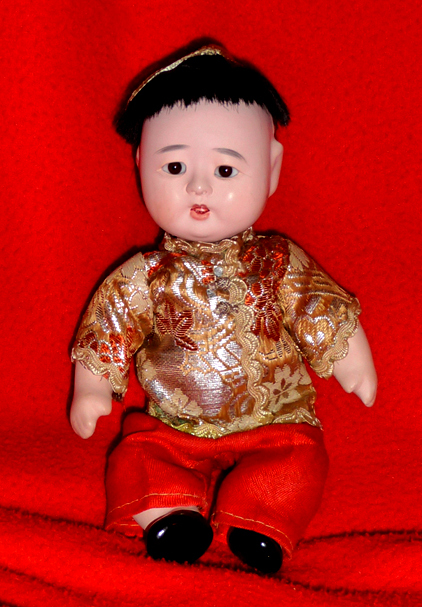 Hello, I have a doll which I believe is a friendship doll. She came into our family around 1923 when my great grandma worked as a teacher in Japan. I would like to know who she is and I was hoping you could help me. I’m afraid I have no way of knowing the answer to your query. 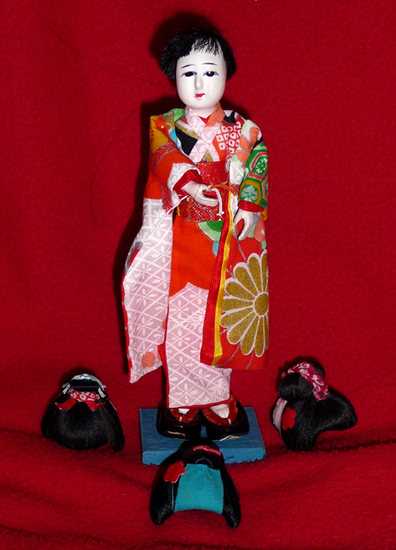 I don’t know if you have found what you were looking for Danielle L. but there’s been missing Japanese dolls brought to the United States from the 1920s and they are having efforts to find them. 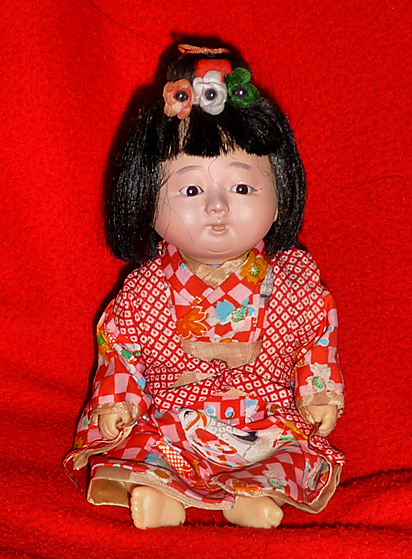 Your comment is a little old and I hope I’m not too late but you can contact Scott Alan Pate’s Facebook on antiquejapanesedolls. He’s an expert on Japanese dolls and I am certain he can answer your question. Thank you for this. Hopefully it will help the information be found.